Electronic Rego Cameras- Easier than ever to get a fine! 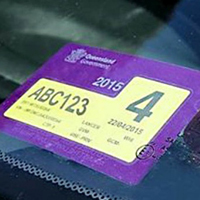 It used to be a fine-able offence to leave your rego sticker on the window after it had expired. So now we have no stickers – are you allowed to keep the old one on? Yes and No. QLD law says if your vehicles is under 4500 kg (4.5 tonne) – which is your car or van, you can LEAVE THEM ON. Light trucks and up need to remove old labels. b) WA changed to electronic rego in 2010, SA in 2011, and NSW in 2013.
c) Not all electronic rego cameras are fixed – there are some that are placed on government and police vehicles. So your rego is constantly checked – even when the office clerk goes to the shops to collect the coffee! d) Governments report a massive spike in fines – usually catching those people who for many years have avoided paying rego as their own private rebellion- BUT it’s now easier than ever to forget to pay and then get stung. We service and repair all makes of cars at your home, work or even a shopping centre carpark. We are based in Albany Creek and can travel anywhere in the Greater Brisbane area.